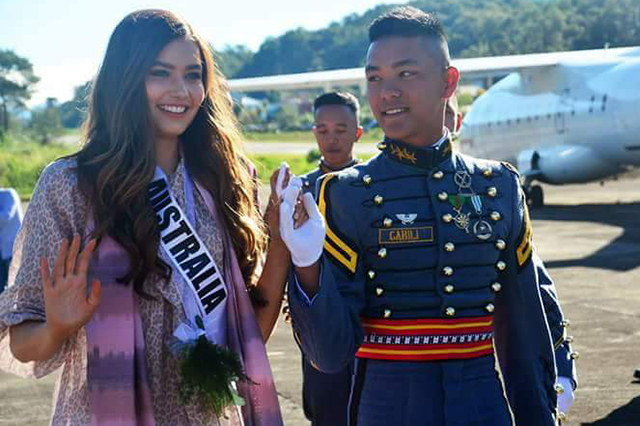 Miss Australia Caris Tiivel was escorted by PMA Cdt. Gabili upon the arrival of Miss Universe 2016 candidates in Baguio City on Wednesday, January 18. 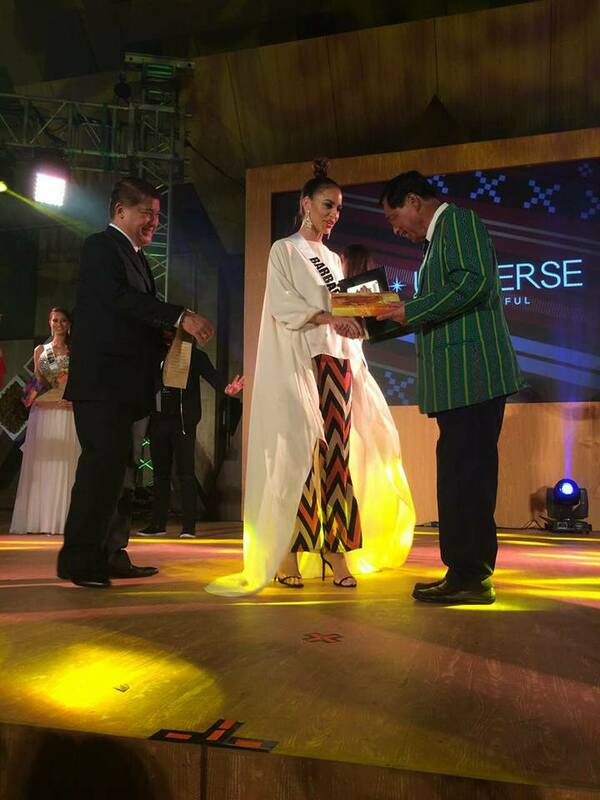 Twenty-four Miss Universe 2016 candidates were invited to a series of events in Baguio City on Wednesday, January 18. They were joined by reigning Miss Universe Pia Wurtzbach (second from right), LCS Group of Companies Chairman Luis "Chavit" Singson (second from left), and Miss Universe Organization Chairman Paula Shugart (third from right). 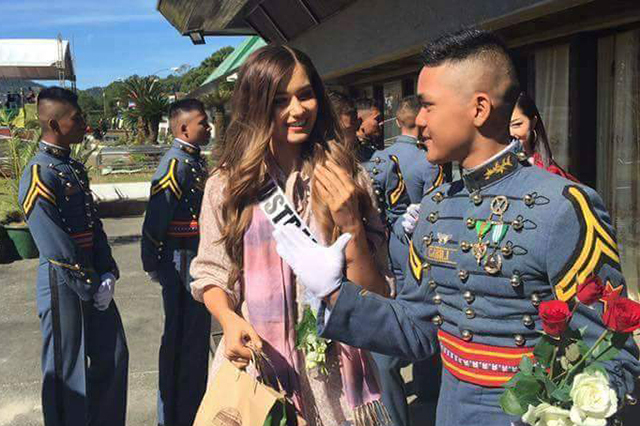 At the Loakan Airport, the beauties were welcomed by the cadets of the Philippine Military Academy, the country's elite school for soldiers. 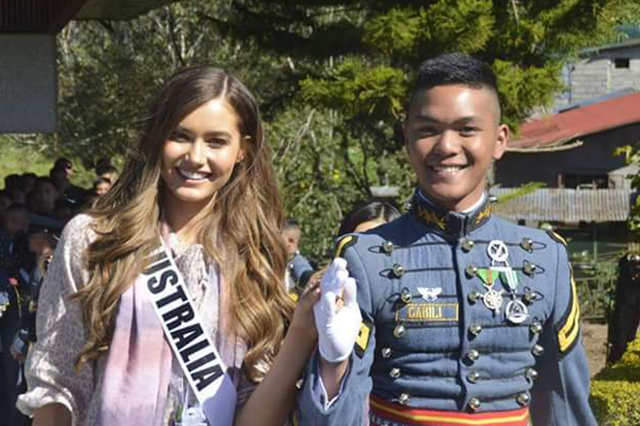 Miss Australia Caris Tiivel was escorted by a cadet whose surname is Gabili. Their photos are currently circulating on Facebook, where the netizens are having a field day talking about this "unexpected love team." See the way he looked at the 23-year-old Aussie model/beauty queen. He seemed mesmerized by Caris's beauty. 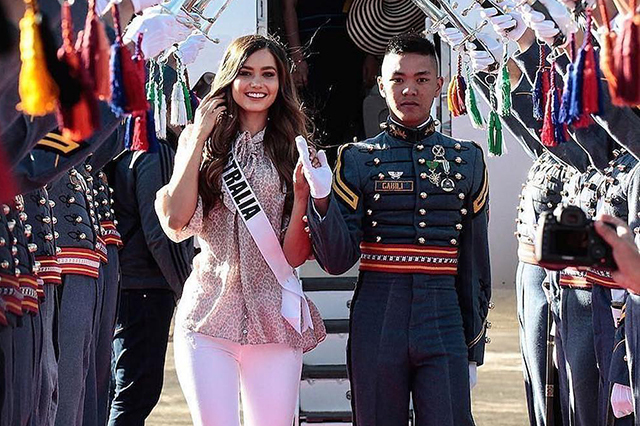 Some pageant fans were quick to point out that when Miss Universe was held here in the Philippines 22 years ago, a Pinoy was also mesmerized by the beauty of Miss Australia's representative. In the comments section, some teased, "Ogie Alcasid and Michelle van Eimeren part two?" A Facebook fan page called Pinoy Hottest Celebrities uploaded the photos, which have, at presstime, garnered over 21,000 reactions. 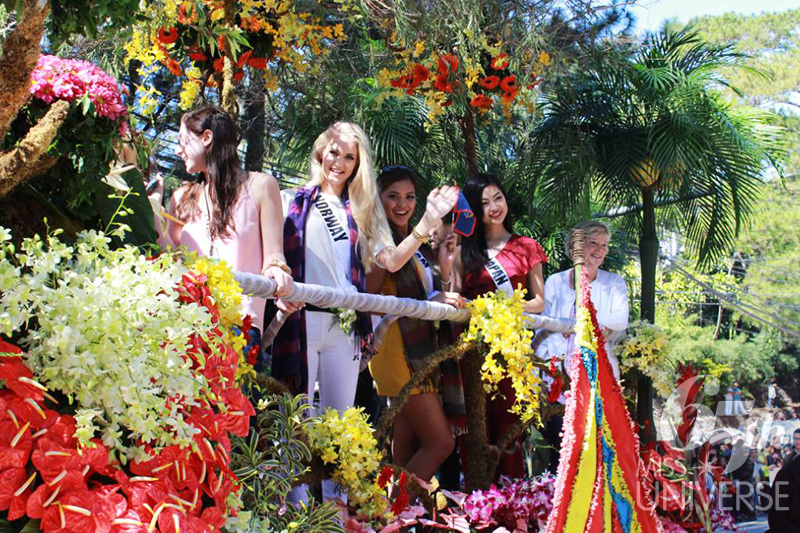 Aside from Miss Australia, the other candidates who visited Baguio were: Miss Denmark Christina Mikkelsen, Miss Japan Sari Nakazawa, Miss Norway Christina Waage, Miss Canada Siera Bearchell, Miss Colombia Andrea Tovar, Miss Kenya Mary Esther Were, Miss Korea Jenny Kim, Miss Kosovo Camila Barraza, Miss Malta Martha Fenech, Miss Mauritius Kushboo Ramnawaj, Miss New Zealand Tania Dawson, Miss Norway Christina Waage, Miss Peru Valeria Piazza, Miss Puerto Rico Brenda Jimenez, Miss Spain Noelia Freire, Miss Albania Lindita Idrizi, Miss Miss Aruba Charlene Leslie, Miss Barbados Shannon Harris, Miss France Iris Mittenaere, Miss Guam Muneka Joy Cruz Taisipic, Miss Haiti Raquel Pelissier, Miss Israel Yam Kaspers Anshel, Miss Italy Sophia Sergio, Miss Slovenia Lucija Potonik, Miss South Africa Ntandoyenkosi Kunene, Miss Sweden Ida Ovmar, Miss Finland Shirly Karvinen, and Miss US Virgin Islands Carolyn Carter. On the Upper Session Road, Baguio locals caught a glimpse of Pia and the candidates while they were on board a Panagbenga Festival-like float. After the parade, Pia and former Ilocos Sur Governor Chavit Singson led the tree-planting activity. Miss Denmark Christina Mikkelsen, Miss Norway Christina Waage, Miss Canada Siera Bearchell, and the rest of the candidates filled their baskets with freshly picked strawberries. The ladies received locally hand-made gifts from Baguio City Mayor Domogan and HRAB Chairman Mr. Anthony de Leon during the gala dinner at Baguio Country Club.